Valerie Grove’s biography of Kaye Webb, one of the most influential post-war British publishers, is both informative and entertaining. Drawing upon reminiscences from Kaye’s family, ex-colleagues and friends, as well as Kaye’s diaries, letters and other papers (now stored at the Seven Stories archive in Newcastle), Grove has drawn a portrait of a beguiling and passionate woman. In a life that appears to have been driven by a constant whirlwind of parties, events, affairs, campaigns, hard work, deadlines and more parties, Kaye was an arch-networker. She had a way of scooping up influential and interesting people, who would often find, to their bewilderment, that they were embroiled in one of her elaborate schemes, undoubtedly involving (as Shirley Hughes recalls) ‘…a fantastic amount of work…’ It is fascinating to discover that this colossus of children’s publishing, who wanted to be an actress when young, and who became the dynamo behind the influential Picture Post, Lilliput and Young Elizabethan magazines, knew little of children’s literature before she joined Penguin Books. It was only when Allen Lane asked Kaye to take over from Eleanor Graham in 1961 on a part-time basis (with no office and no staff) that she started the career for which she is best known. She discovered the workload daunting. ‘…you’ve got to read every one of them first… and with quite a different eye.’ But she still went on to create what is generally regarded as a second golden age of children’s books, through which (and through the Puffin Club) she touched and influenced so many children’s lives. 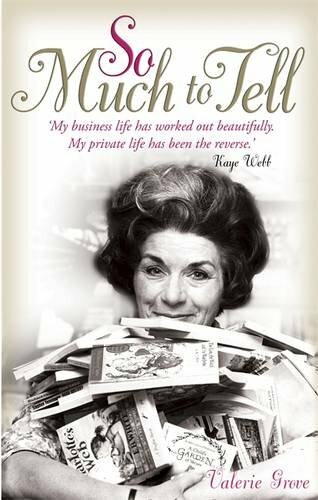 And yet, for all the success Kaye enjoyed in her professional life, the regrets she carried about her private life, particularly the failure of her third marriage to the artist, Ronald Searle, were never far below the surface. Rich in detail and suffused with warmth, Grove's narration of this remarkable life will be enjoyed by students of publishing history and others alike.